Lawyers for Egypt's deposed Islamist president appeal his sentencing to 20 years in prison for the arrest and torture of protesters. Lawyers for Egypt's deposed Islamist president, Mohammed Morsi, on Thursday appealed his sentencing to 20 years in prison for the arrest and torture of protesters during his mandate, AFP reported. Morsi, who was ousted by then army chief and now President Abdel Fattah al-Sisi in July 2013, was convicted in April over the protest outside a Cairo presidential palace in December 2012. He was accused of ordering violence to be used against protesters to disperse them. "We had to appeal before the time available to do so expired," defense lawyer Abdel Moneim Abdel Maqsud told AFP. He said he had submitted the request "in his capacity as legal representative of Mr. Morsi". Abdel Maqsud said he had not been able to consult his client in advance, but did say that Morsi "refuses to appeal," as he considers himself still to be president and rejects the legitimacy of his judges. 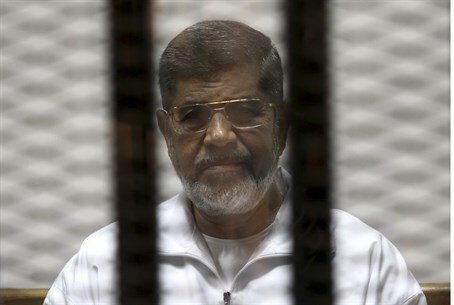 The Islamist former president faces several trials in Egypt. On Tuesday, a court upheld a death sentence against Morsi for plotting jailbreaks and attacks on police during the country's 2011 uprising against Hosni Mubarak. The sentence was originally given last month, but a final ruling on it had been postponed until June 16 pending consultations with Egypt's Grand Mufti, the country's highest religious authority. It also sentenced Morsi to life in prison on charges of spying for the Palestinian Hamas movement, Lebanon's Shiite Hezbollah and Iran.